“We are excited to partner with an organization like TGH that provides excellent, innovative care,” said Andrew Molosky, MBA, FACHE, CHPCA, president and chief executive officer, Chapters Health System. Located on the fourth floor in the East Pavilion at Tampa General Hospital (TGH), LifePath Hospice will open its new inpatient hospice unit on Monday, October 1. The 8,500 square-foot unit featuring 16 private rooms is the first of its kind in Hillsborough County. The hospice unit provides short-term, round-the-clock care for individuals who have terminal illnesses and require acute medical care. LifePath Hospice team members work with the patient, family and physician to develop an individualized care plan to offer intensive treatment during a medical crisis. The LifePath Hospice unit at TGH is designed with most of the amenities one would find in their own home. Family and friends may visit any time and stay overnight. Within the unit, there is a kitchenette, lounge and on-site laundry room for use by families and guests. 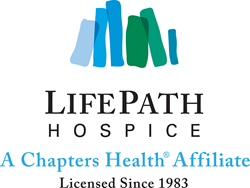 LifePath Hospice, an affiliate of Chapters Health System, is a community-based, not-for-profit organization that supports approximately 7,400 patients each year in Hillsborough County as they face the challenges of advancing age and illness. Healthcare professionals and trained volunteers embrace the LifePath Hospice mission to make the most of life by relieving the suffering of patients and their families affected by serious health issues. Since 2008, the organization has been accredited by The Joint Commission, the nation’s premier healthcare accrediting body and in 2017 was awarded deemed status. In addition, LifePath Hospice first received accreditation from the National Institute for Jewish Hospice in 2007, which means staff members have undergone specialized training to better serve the needs of patients and their families across the entire range of faith traditions and observance within the Jewish religion. Tampa General Hospital, a 1010-bed, non-profit academic medical center, delivers world-class care as the region's only center for Level l trauma and comprehensive burn care. It is one of the nation's busiest adult solid organ transplant centers and is the primary teaching hospital for the USF Health Morsani College of Medicine. Advancing medicine through innovation, Tampa General houses a nationally accredited comprehensive stroke center, an 82-bed Level IV neonatal intensive care unit, and a state-certified spinal cord and brain injury rehabilitation center. For more information, go to http://www.tgh.org. Founded in 1983 as a compassionate not-for-profit organization, Chapters Health System provides choices, education and guidance for those affected by advancing age or advancing illness through its managed affiliates: Good Shepherd Hospice, HPH Hospice, LifePath Hospice, and Chapters Health Palliative Care, located in Citrus, Hardee, Hernando, Highlands, Hillsborough, Pasco and Polk counties. In 2018, Chapters Health was certified as a great workplace in the Aging Services category by the independent analysts at the Great Place to Work® Institute. In addition, Chapters Health operates HPH Home Health, which serves the needs of patients in Pasco and Pinellas counties. Learn more at http://www.chaptershealth.org, like us on Facebook and follow us on Twitter and LinkedIn.